Quality carpets and flooring at below showroom prices! 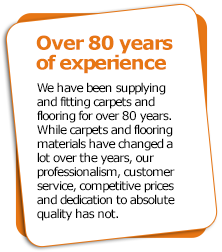 We have been supplying and fitting carpets, real wood flooring, laminate,vinyl and safety flooring to clients across Kent for over 80 years! Providing Medway’s finest mobile flooring service, we save on expensive showroom costs to offer you substantial savings on carpets and flooring from all the leading manufacturers and brands, including Karndean and Amtico! As we bring everything to you, you can colour match your new flooring with ease. Not sure what would be best installation for your home or business? Ask our friendly flooring fitters – they will be more than happy to provide you with honest and impartial advice. Call us today on 01634 294414 to go through your own safety flooring, vinyl flooring or new carpet requirements with our expert carpet fitters. They will guide you through the process of receiving the perfect designer flooring for your property and will be able to bring examples of our range straight to your door through our mobile showroom. Get your own no obligation quotation for your new carpets or real wood flooring and free property survey today! Browse through our flooring samples in comfort! 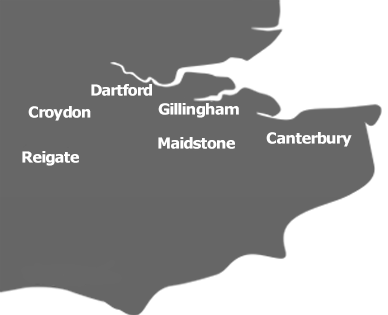 Operating throughout Kent, including Sittingbourne, Tonbridge, Maidstone, Ashford, Bexley, Rainham and Bromley, we come to you in a van laden with thousands of samples of carpets, designer flooring, vinyls, laminates, safety flooring and real wood floors for you to browse through in the comfort of your own home or office. We have a phenomenal range of floor coverings on offer, in every colour, design and material you could imagine. No matter if you are looking for a stylish and comfortable carpet for your living room or bedroom or you require a hard-wearing vinyl floor for your bathroom, Lifestyle Designer Floor Coverings will provide you with exactly what you need. We provide the highest quality oak flooring and carpets to properties around Kent, ensuring that they receive a professional installation from our expert carpet fitters. Our flooring fitters will ensure you receive the highest quality flooring that lasts a long time and will assure that this standard is met. Every Lifestyle Designer Flooring customer receives free expert advice, best possible prices, grippers and other accessories at much less than major retailers will charge. 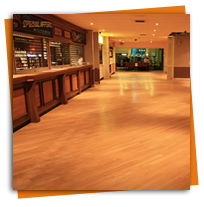 We also offer an unrivalled choice of high quality flooring options and outstanding after-sales support. Operating throughout Kent, we create the ideal flooring solution for any domestic or commercial property anywhere in the South East. Our experienced and dedicated fitters have recently undertaken flooring fitting projects for homeowners and commercial clients in Rainham, Gillingham, Rochester, Maidstone, Sittingbourne, Faversham, Whitstable, Herne Bay, Ramsgate, Canterbury, Caterham, Aylesford, Beckenham, Reigate, Crawley, Dartford, Bexley, Bromley, Ashford, Sevenoaks, Tonbridge, Tunbridge Wells, Sheerness and Gravesend. If you would like any more information about our extensive range of carpets and flooring, please contact us today. One of our friendly flooring team will be happy to discuss your requirements and arrange your free no obligation survey and quotation at your convenience.